On this episode of DTB’s “Tour Tips (Top 5)”, the metal band, Superjoint, recommends their tips for being on tour, while on tour with Battlecross and Child Bite. Superjoint is best known for their songs “The Alcoholik” and “Ozena”. On this episode of DTB’s “Tour Pranks”, the metal band, Superjoint, reveals the pranks they’ve pulled on tour, while on tour with Battlecross and Child Bite. 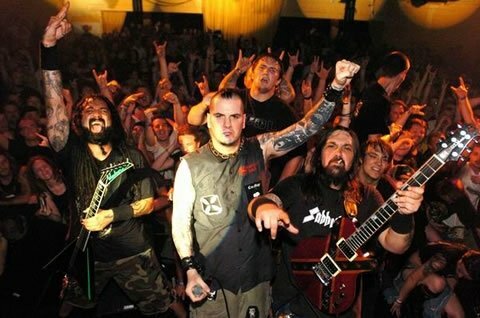 Superjoint is best known for their songs “The Alcoholik” and “Ozena”. On this episode of DTB’s “Bus Invaders”, we take you inside the touring vehicle of the metal band, Superjoint, while on tour with Battlecross and Child Bite. On this episode of DTB’s “Crazy Tour Stories”, the metal band, Superjoint, shares crazy moments from touring, while on tour with Battlecross and Child Bite.